I write this in the week that Donald Trump has been elected the next President of America. It is four months since Britain voted for Brexit. I write as someone brought up white working class, who is now being told that the white working class, the white poor, the white disaffected made these choices. I look at the statistics and I see this is partly true – but I also see that many wealthy people voted for Trump and for Brexit, some people of colour voted for Trump and for Brexit. The statistics show clearly that many in our UK cities did not vote for Brexit and many in US cities did not vote for Trump. There is a growing divide. After three years of working on our exponentially-growing Fun Palaces campaign I see what we are doing as a step towards healing these divisions. After 35 years in the arts as a writer and theatremaker, it is clear that the steps we have taken towards inclusion and diversity are too little, too late – our attempts at cultural inclusion are too often about audience development rather than welcoming new people into the arts as artists. Fun Palaces – multidisciplinary cultural events created by and for local communities – believes in everyone an artist (and everyone a scientist, but that’s for another blog) and that by enabling everyone to engage with culture as practitioners we can create a more inclusive, more engaged, more diverse society, with a more equal culture at its core. For too long our cities have held up the arts as something to visit, housing culture in big shiny glass and concrete buildings, usually in the centre of the city. But why should people make a pilgrimage to the arts? 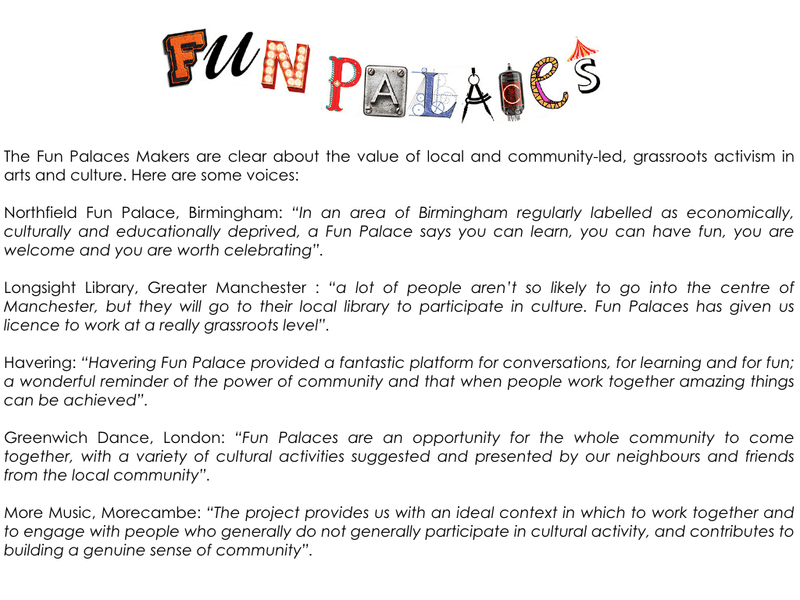 Fun Palaces helps communities to create their own local arts and cultural events, led by and for those communities, whether they self-define as artists or not. Further, we believe that not only can art and culture be made and shared from the most grassroots community level, but when it is, the impact on that community is deeper and more lasting. When everyone is an artist, everyone can create, everyone can reach out to others, everyone is heard. The interest and enthusiasm for our campaign is phenomenal. We are just three years old, with a tiny staff of four, all part-time. In 2014 there were 138 Fun Palaces with 40,000 participants; in 2015 there were 142 Fun Palaces with 50,000 participants; and this year in 2016, there were 292 Fun Palaces created by 5000 local people, by and for their own communities, with 120,000 participants. While Fun Palaces have predominantly been in the UK, they have also been made in Ireland, France, Germany, Iceland, Norway, Australia, New Zealand and Canada. Crucially in the UK this year, 85% were created outside London. Fun Palaces enables citizens to create by and for themselves, without always looking to the metropolitan core for answers. This means that people do not have to go to the centre to engage with art – they can create it themselves, in their suburbs, their inner city housing estates, their small towns and villages. 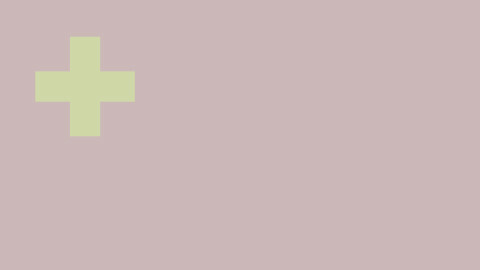 We’re very new, so it’s hard to know exactly where this will lead, but we hope this wide creative community participation can contribute to creating a more truly engaging culture, genuinely for all.